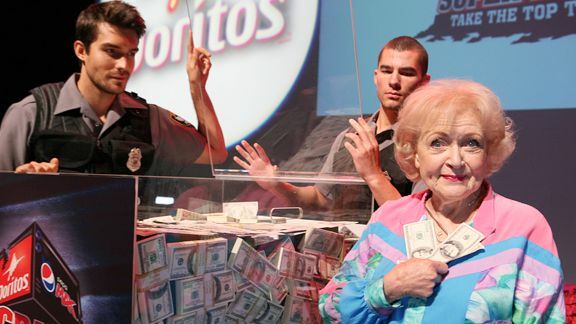 Ketchum Sports & Entertainment Actress Betty White is spokeswoman for Doritos and Pepsi Max Crash the Super Bowl ad campaign. Actress Betty White parlayed an appearance in a Super Bowl commercial for Snickers into a return to the mainstream consciousness this year. Now, she's teaming with Doritos and Pepsi Max to help someone else's dream come true. With Super Bowl commercials being so popular, Doritos and Pepsi Max are looking to pay out a total of $5 million to the winners of its Super Bowl ad contest starting Sept. 27 and running through Nov. 15. Contestants can upload 30-second commercials for Doritos chips or Pepsi MAX or both to crashthesuperbowl.com. Finalists will make $25,000, and if the ad becomes popular it could be worth $1 million. "Just like me, creating a commercial that is played during the Super Bowl could be a life changer," said White, who was hired as spokeswoman for the campaign. "This is a very exciting program that will allow people to be creative and will challenge people to try to crash the Super Bowl. It sounds like a fun game." That Super Bowl commercial for Snickers was cool. It's like you came back into the spotlight again. "I never have gone away! But ever since that commercial came out, it opened all these doors. That's why Pepsi and Doritos came after me." The world is going ga-ga over you. Who is your perfect date? "Robert Redford. That's my standard answer for everything. If someone says, 'How was your day? ', I say, Robert Redford." "I don't have much time anymore. I work all day and I come home and do crossword puzzles. I'm sorry to say that I don't watch much TV anymore." You've done a lot of work since February. What else is on tap? "I'm thoroughly enjoying everything. I have a movie -- 'You Again' -- coming out Sept. 24. I did a show for TV Land called 'Hot in Cleveland.' I even hosted 'Saturday Night Live.' I had only one thing left on my bucket list: To appear in a Hallmark Hall of Fame movie. And guess what? I'm flying to Atlanta shortly to start filming one." OK, we know what you've done. What has happened to actor Abe Vigoda, who also was in that Snickers commercial? "Yeah, we are the two oldest people on the planet. The last time I saw him he was still down in the grass with a face full of mud."